"Face value" comes from the days of paper stock certificates. 2. Is the Face Amount of Life Insurance Included in My Gross Estate? Except in rare cases, corporate shareholders no longer receive fancy stock certificates as evidence of ownership. Their shares exist only as numbers in digital registries. Even so, many stocks still have a "face value," more commonly called the par value. At this point in the evolution of financial markets, the importance of the face value of shares is mostly historical. The face value of shares was originally used to ensure that companies did not sell shares to the public for less than a specific price point. Companies are organized under state laws. 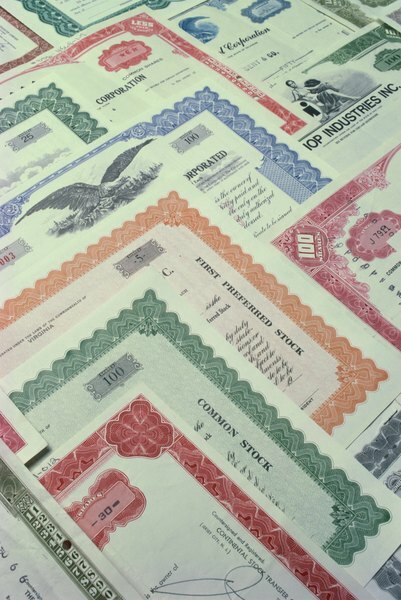 Back before computerized financial markets and the instantaneous worldwide flow of information changed the way people dealt with stocks, states required companies to designate a par value for their common stock, which usually got printed on the face of the stock certificate. States didn't tell them exactly what the par value had to be, just that companies had to set one. Par value was designed to protect investors in an era of limited available information. State laws barred companies from selling their stock to the public for less than par value. Corporations often sold shares at par value, though they were allowed to sell them for more. If you were an 1800s investor who bought shares from a company at $2 a share, you didn't want the firm to turn around and sell shares to someone else for $1.90. But if the par value were $2, you knew the company couldn't go lower. Even if par were $1.75, you at least would have bought the stock knowing that the company could go lower. Par value also gave a shareholder a claim on company assets. If stock had par value of $2, you were essentially entitled to turn in the stock for $2 worth of cash or some other asset. Companies eventually figured out if they set their par value extremely low, they would never have to worry about selling shares too cheaply or having to satisfy demands for assets. This pretty much doomed par value. Today, companies commonly have par values of a penny or a fraction of a cent. Many states now allow corporations to declare that their stock has no par value. In the 21st century, par value is a bit of living history -- the vestigial tail of the equity markets. One place where you can still see the shadow of shares' face value is on the balance sheet of a corporation with par-value stock. The stockholders' equity section of the balance sheet identifies how much money the company has raised by selling shares. If the stock has a par value, the "common stock" equity account will show only the money from the par-value part of the stock sales. Anything above par value will appear in an equity account called something like "additional paid-in capital." For example, if a company sells 1 million shares of 2-cent par-value stock for $30 a share, its balance sheet will show $20,000 in common stock (2 cents times 1 million) and $29.98 million in additional paid-in capital. AccountingTools: What Is No Par Value Stock? Investopedia: Why would a stock have no par value? What Happens to the Value of a Stock When It Divides Into Two or Three Companies? What Is a Stock With No Face Value Called?